Please Note: If images are not loading in this email, click here. Welcome to Old Cardboard, the most complete reference resource for information about collecting vintage baseball cards and related memorabilia. More information about this eNewsletter and its companion website and magazine are found at the bottom of this page. The following is a summary of vintage card events coming up in the next 30-45 days. For the most current listings on additional vintage card shows and auctions, see the Key Events Calendar on the Old Cardboard website. Have an event that needs to be on the OC Calendar? 15 Austin, TX Distribution of Old Cardboard Issue #34 (see website for details). 19 Internet Bagger's Auctions (see website for details). 21-23 White Plains, NY White Plains Sports Card Show (see website for details). 21-23 Strongsville, OH Ohio Sports Collector Convention (see website for details). 29 Phone/Internet Goldin Auctions (see website for details). 29 Phone/Internet Small Traditions Auctions (see website for details). 30 Phone/Internet Robert Edward Auctions (see website for details). 4 Phone/Internet Huggins & Scott Auctions (see website for details). 6 Phone/Internet Memory Lane Auction (see website for details). 11-13 Dallas, TX Heritage Premium Sports Collectibles Auction (see website for details). 18 Phone/Internet Sterling Sports Auctions (see website for details). 31 Phone/Internet Clean Sweep Auctions (see website for details). 31 Phone/Internet Hunt Auctions (see website for details). 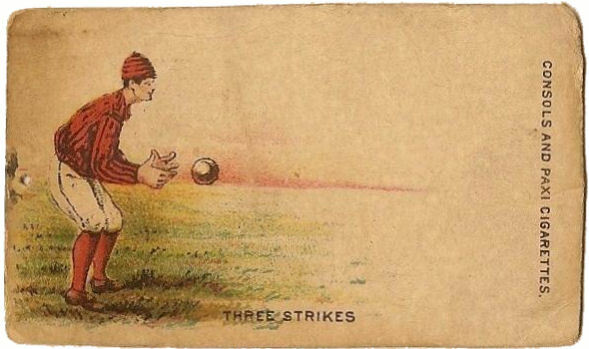 The little known 1889 N354 "Turn Card" set contains 25 cards with coordinated pictures printed on the two sides of the card. When rotated rapidly on their horizontal axis, the two pictures blend into one, as illustrated in the images below. "An entirely novel design in advertising is being issued with these cigarettes, consisting of an application of the thaumatrope, or revolving pictures. To illustrate this, on one side of a card is a camel, on the other a rider. Twirled between the fingers, the rider appears to be seated on the camel. There are in this connection, fencers, ball players, and numerous designs, covering twenty-five subjects, which cannot fail to attract great attention." 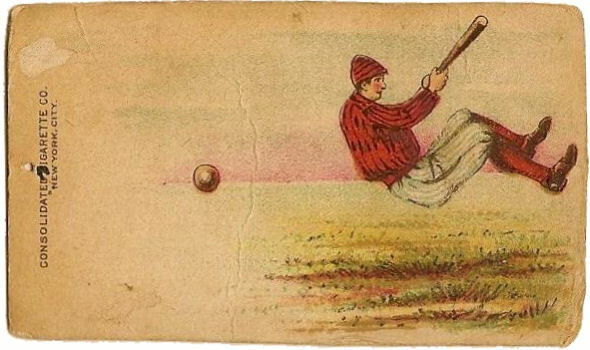 The unique design and "thaumatrope" technique were very unconventional for card sets for the period. And while the set was known to Jefferson Burdick when he compiled his American Card Catalog, the cards are considered very rare among today's vintage collectors. Note: The animated gif image (abover right) may not display properly in this email view. If not, click here to view from your browser. Note 1: According to Wikipedia, a Thaumatrope is a Victorian optical toy constructed from a simple disk or card featuring a different picture on each side and attached to two pieces of string. When the strings are twirled rapidly the card rotates on its axis and the two images appear to combine. The technique is usually credited to British physician John Ayrton Paris. Paris was said to have used one to demonstrate persistence of vision in the human eye. In effect, it is a primitive version of animation techniques used today. Note 2: The 1889 dating of the N354 set is attributed to the research of Joe Gonsowski. Joe's article, "19th Century Tobacco Journal Offers Fascinating Glimpse into Hobby's Early Collectibles," is printed in Issue #34 (Spring 2017) of Old Cardboard magazine (see Section 4 below). The article provides very interesting insight into the N354 cards as well as many other popular card sets of the period. A Profile Page for the N354 "Turn Card" set has been added to the Old Cardboard website. 1936 R313 National Chicle "Fine Pens"
Updating the website with checklists and full set galleries for additional vintage sets is an ongoing project, so check back often to check out the latest additions. There are now many thousands of card images on the website and the list continues to grow every month. We welcome and encourage feedback with checklist additions, images of cards missing from our galleries, error corrections and suggestions. Please send all feedback to editor@oldcardboard.com. Beyond the above pages recently added to the Old Cardboard website, we continue to expand and refine our eBay Custom Search Links to make finding vintage baseball cards on eBay easier than ever. The results of these searches are continuously changing, so check back often to find the most recent eBay listings. Samples of a few of these custom searches are provided below. Hundreds more are provided on the Set Profile pages throughout the Old Cardboard website. Issue #34 (Spring 2017) of Old Cardboard magazine was just delivered to USPS by our printer. It is quite literally "in the mail" and scheduled to arrive to our subscribers by the end of April. The fact-filled issue contains a balance of articles about card sets from the nineteenth century through the early part of the twentieth. The cover (shown at right) features Brooklyn Catcher Chief Meyers, derived from his card in the 1916 D381 Fleischmann Bakery card set. The above feature articles are in addition to the magazine's regular "Editor's Notebook" section as well as informative messages from our sponsors. Lifetime subscriptions to the magazine can be ordered for only $20 on the Old Cardboard website at www.oldcardboard.com. If you have not already subscribed, order yours today and your subscription will start with Issue #34. Shout-out to OC Authors. Without authors for the detailed articles published in Old Cardboard magazine, the magazine would not exist. We would like to give a special shout-out to Bill Cornell, Jim Sexton and Joe Gonsowski. All three are authors in the recently released Issue #34 (Spring 2017) of OC magazine and all are repeat authors. 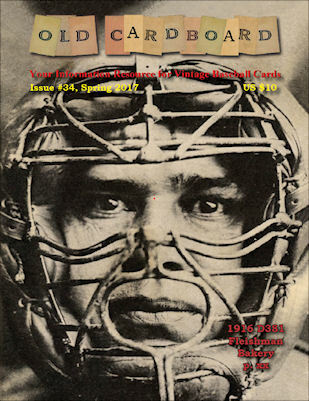 Thanks again to Bill, Jim, Joe and all OC authors for your continued contributions to the vintage baseball card hobby. Old Cardboard, LLC. was established in December 2003, to help bring information on vintage baseball card collecting to the hobbyist. Produced by collectors for collectors, this comprehensive resource consists of three components: (1) Old Cardboard Magazine, (2) a companion website at www.oldcardboard.com and (3) this eNewsletter. The Old Cardboard website contains more than 500 pages of descriptive reference information for baseball card sets produced fifty years ago or longer. Each of these set summaries has a direct set-specific link to auctions and a similar link to 's powerful search engine for further research. The website also includes a Show and Auction Calendar, an eBay Top 50 Vintage Sellers List, and much more. As a result, the Old Cardboard website makes a great "Alt-tab" companion for vintage card shoppers and researchers. Old Cardboard eNews provides current hobby news, upcoming shows and auctions, and updates to the website and the magazine. It is published around the middle of each month. For a FREE subscription to the eNewsletter, or for subscription information on Old Cardboard Magazine, please visit the website at www.oldcardboard.com. If you find this information resource helpful, please tell your friends. We need your support and your feedback. Thank you.